This is my first AAR and first win, I bought this game back in 2013 (i think? Edit: Steam says I got the 'Control 2' achievement July 10 2013, so that's probably very close to when I bought the game) and had played a few times but never won. Usually by the midgame I'd become overwhelmed with the amount of stuff going on and get 'analysis paralysis' and then get distracted and put the game down for an extended period of time. Anyway, I set out to win it a little over a week ago and have been playing daily in pursuit of that. I decided to play a standard 80 planet map with ships set to simple and no expansions. The only minor plot I turned on was the Avenger. In the past having too much stuff going on contributed to me feeling overwhelmed in the midgame so I kept it simple for this game. I selected Random Easier for both my opponents, and anti-armour ship for my starting ship. My reasoning was that I remembered AI starships as being one of the more dangerous things in previous games, so I figured anti-armour would help me kill those as well as being a low-micro force multiplier. Began by setting up defenses per Kahuna's excellent guide on this site. ^Here's an example. The turrets are lined up such that the tractors fall on the straight line between wormhole and command station, and the edge of the tractor range is just ever so slightly inside the edge of the needler turrets range. Anyway, it worked pretty well when waves went for the command station, which I suppose is the most immediately dangerous thing the AI can do. However, they would not always go straight towards my command center, and sometimes this would mess up the positioning. I think some of that may have been to do with the fact that I was scattering sniper turrets around and so the AI was chasing those, and some may have had to do with the AI looking at my forces and deciding to retreat. When the AI would spread out and go after the snipers and harvesters, this was annoying but not super dangerous and eventually my turrets would kill all of them. 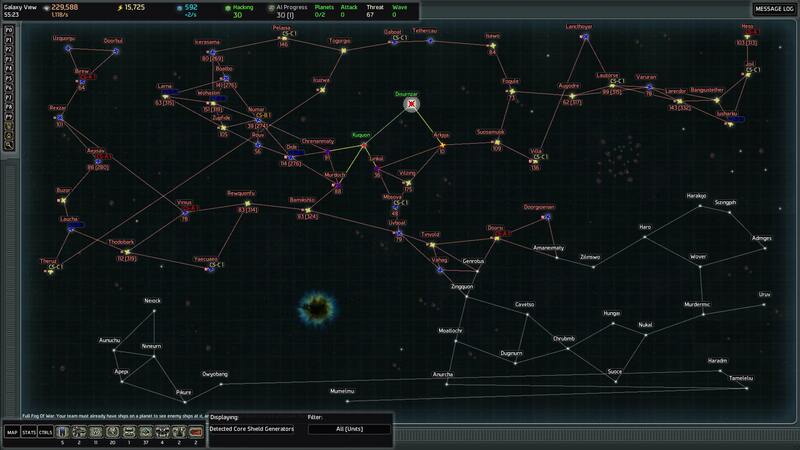 Othertimes though the AI would go straight for a wormhole, and then be added to the threat fleet once they escaped. Occasionally they'd even retreat through the wormhole they entered from, literally seconds after the wave began, which felt difficult to do much about. More on that later. I unlocked Harvesters MkII, Scouts MkII and Scout Starships MkII to start. I pretty much always take those as I like being able to scout and I feel like the extra metal really helps me build up my forces in the beginning and then maintain it until the end. After a bit of scouting I wasn't seeing any cool targets super close to me so I decided to take one of the systems adjacent to mine that had a CSG-E and 7 metal. I figured an extra planet worth of economy and science would help me launch some deeper raids. which I was proud of. As you can see, there's a cluster of ARS's off to the left that would be my first target. I figured I'd take the three of them, and the planet in between them, and get a contiguous 4 planets island with only one capture that was not strictly necessary. I'd also eliminated a lot of places as potential AI homeworlds and could see a potential chokepoint right at the edge of my scouting (and as a bonus one of those systems contained an ARS). I also saw an ARS and a fabricator directly next to each other in the upper right that looked appealing. There was an also an advanced factory near my homeworld. It had a lot of wormholes next to it though and didn't really fit with the rest of my plans, I was pretty sure there were usually (as it turns out always) two advanced factories per map so I decided to keep scouting and see what turned up. Taking the cluster of ARS's went pretty easy. For the most part, I'd look at the hull types and attack bonuses of a given guard post, and then assault transport a blob of ships that matched up favorably to take care of it. I think around this time I unlocked Bombers MkII to assist with taking down fortresses. One thing that surprised me is that when I captured the third ARS it alerted me that I'd unlocked Electric Shuttle, which I was positive I'd unlocked already. Turns out I had, and you can get the same ship type twice which means no new ship. I hadn't realized that and decided to load a save game and do a research redirect to rectify that. In general, I tried to avoid overusing saving and loading, and would try to live with or adapt to bad choices and situations, but in this instance I hadn't known that gaining a duplicate ship type was possible and didn't like the idea of taking an ARS for essentially nothing. Going forward I'd 'check' ARS systems with a science lab which is easy enough to do. Anyway, I ended that excursion having gained Raptors, Electric Shuttles and Parasites. 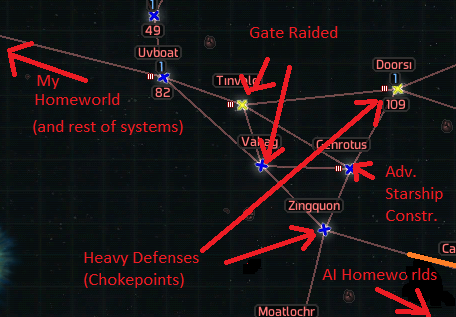 I decided to gate raid three of the planets adjacent to my island so that only one system in the island would have hostile wormholes. I could then set up economic command centers on the 'safe' systems which i thought would help my economy. I also knowledge hacked two of the systems since they were isolated and I knew no outside ships would disturb me while that was going on. After that I had a huge surplus of knowledge, above 20,000 I think, but wasn't sure what to spend it on. I think I got some hardened force fields and upgraded the rest of my trianlge ships to MkII. Also I got Flagships MkII at some point, since it seemed like it would help no matter what I did with the rest of my fleet. Also a thing that came up is that while gate raiding planets removed the threat of waves, there was still the possibility of loose 'threat' ships to attack my undefended 'safe' systems. That happened with one of them but thankfully my fleet was nearby enough to prevent the loss of the command center. I put some defenses up after that, which I think never were used again. After that I decided to target the ARS, and some of the Fabricators, in the upper right. There was one fabricator that was 5 hops from my home system, and that would serve as a 'stepping stone' system to the other Fabricator and ARS which were 8 and 9 hops respectively. I had to deal with deepstrike for the first time, but since I couldn't see where the threat was spawning it was just kind of a numerical increase in threat that I figured I could deal with later. Anyway, I got a MLRS Fabricator and a Missile Frigate Fabricator, and got Bulletproof Fighters from the ARS. These were all ships I liked. Something I noticed is that when I tried to send an assault transport from my home system to the stepping stone system, it would take one path through the adjoining systems, but when I did the reverse it would take a different path (there were two different routes of equal jumps). This was a problem because I'd only cleared the one path of tachyon sentinels. I'd eventually end up clearing the other, and doing this in a few other places in my empire, which was a little tedious but not terrible. Anyway, with this stuff captured I was feeling pretty powerful. There was a cpa in here somewhere, i think before I took these systems. I forget mostly because it was pretty underwhelming and comparable in some ways to my larger reprisal waves. I should also mention I was popping data centers whenever I could, I'd use Assault Transports + Bomber Starships if the data center wasn't beneath a forcefield, and Assault Transport + Raid Starship if it was. Besides the previously mentioned instance where threatfleet poured into a system I'd deemed safe because I'd gate raided the only adjacent system, the AI had not done anything scary up til this point. After taking these systems I decided to tachyon raid up til the homeworlds and try to get full scout coverage along the path I'd be using. I didn't realize homeworlds had full tachyon coverage that would make it impossible for a scout to hang out there, but that was fine. I also started deleting scouts from elsewhere in the galaxy that I didn't need to be watching so that I could have more scouts for this without having to spend more knowledge. I also decided to neuter the core world I'd be passing through on the way to the homeworld. Partially so I wouldn't get interference from there during the homeworld assault, and partially to 'test out my fleet' against the higher mark units and structures. My fleet fared well at destroying the guardposts but I created a lot of threat in doing so. 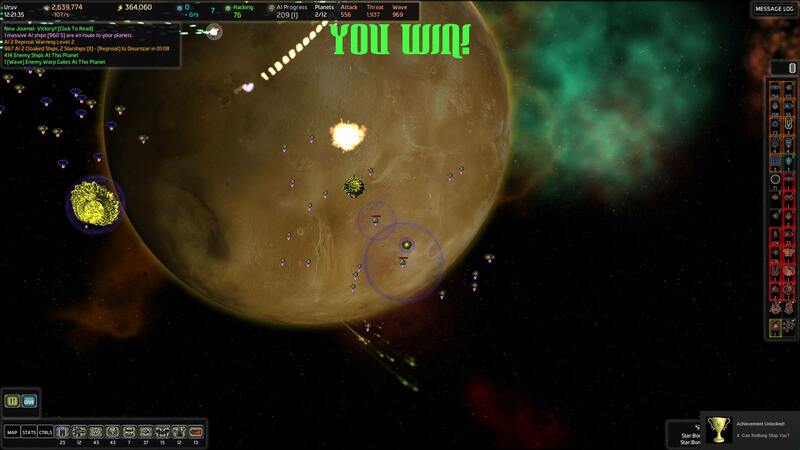 Also at some point a ton of Riot Control Starships poured into a system I was fighting in and I had to kill those. I'm not sure if those were special forces, or strategic reserve, or maybe perhaps the response from my earlier deepstriking, but that was surprising although not very deadly. Anyway, I created a lot of threat and would soon learn that simply looking at the number of threat ships listed in the upper right didn't tell the whole story since these ships were significantly more dangerous than what I'd faced before (they were MkV and there were a lot of guardians and starships). I've since started paying attention to the 'strength' listed in parantheses. More on that later. At this point my fleet consisted of MkV Missile Frigates and MLRS, MkI-IV Fighters, Bombers, Bulletproof Fighters and Anti-Armour ships (I elected not to upgrade missile frigates to MkIII-IV since I had the fabricator for them and the similar MLRS's. I also got Bomber and Flagships I-IV. I paid a hefty sum to upgrade Riot Starships up to MkIII, thinking that because I had an ASC I would get MkIV Riot Control starships as well. Apparently that's not the case, but it was still worth trying. For the most part I used MkIII and higher of everything I had that for for my actual attacking, and MkI-II of everything else as a sort of mobile defense squad. There was a second CPA at some point, half of which spawned in the part of the galaxy past my chokepoint (maybe assembled from existing threat? ), and the other half assembled on an AI Homeworld. I dispatched the former easily but the latter just hung out and added even more to the threat number, which was at about a thousand. Anyway, I researched Fortress MkI's and put one on my main 'chokepoint' planet, one on my advanced factory planet, and three on the staging planet for the first AI Homeworld attack, with the idea that they'd be there to meet the avenger once he rolled through. From the time I'd taken my second planet until now I'd had more energy than I knew what to do with, but Fortresses cost so much that they got me looking at that. 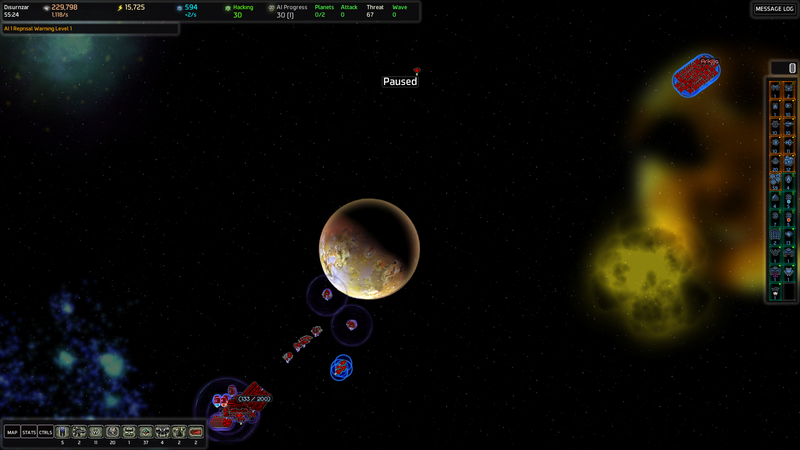 More on that later, for now I loaded up some assault transports and got ready to take on my first AI homeworld. Using Scout Starships MkII to boost their cloaks, I got the AT's to a far edge of the homeworld where the AI had two guardposts and their only ion cannons. I was able to take out all of those extremely quickly, and then the AI started throwing masses of MkV ships at me. I had my ships stay out there, since they were out of range of any of the still living guard posts or the fortresses. Eventually I'd killed the bulk of the ships the AI had and it wasn't creating new ones nearly as quick. At this point I'd taken moderate to large casualties and spawned a really big reprisal wave (although I didn't quite appreciate how big more on that later). My bombers were holding up ok, and all my bomber starships were still alive, so I loaded them onto a transport and started zipping over guardpost to guardpost. The timer said we still had 5 minutes until the exogalactic whatever, so I decided to take out as many guardposts as I could while the rest of my fleet kept the AI's ships busy. I think i eventually wound up taking down all but one of the guardposts, before booking it out of there. Anyway, I retreated my bomber and flagship starships out of there, but lost all my fleet ships. I still had a bunch of lower mark ships and rebuilt higher mark ships at my staging planet, which the exo strike force was going to have to come through, so I figured I was good. Then I got a message saying one of my command stations was under attack. I went over to that system and a carrier of space planes, spawned from the reprisal wave, had taken out one of my forcefields and very very quickly killed the command center. It was annoying because space planes on their own never seemed to do anything against force fields. Maybe they would have in huge numbers, but it seemed like it was specifically the conversion into a 'carrier' unit that allowed them to damage the field so fast. Frustrating, but not a big deal I thought since it was just an ARS system and there were no irreplacable capturables (like an advanced production facility or fabricator) on that system. Unfortunately, when they destroyed my energy collector it sent me into brownout mode. This meant my force fields were no longer fuctioning, which was an issue because the planet set to receive the exo was reliant on force fields. Thankfully the exo force moved slow and I was able to rebuild said energy collector and command station before they got there, getting my shields up just in time. So that was tense to say the least. I probably could have done other stuff like scrambling a matter converter or destroying some non-essential stuff elsewhere in the galaxy, but that didn't occur to me at the time. With the forcefields up the exo strike force died pretty quick. I was still a little worried the starships would be able to whittle down my force field before the guns killed them, but that was not the case. Anyway, I rebuilt my forces on the staging planet, and sent some transports full of bombers to the AI homeworld to finish the job. They did so pretty quickly, although the forcefield around the AI command station a little more time than I'd have guessed. Anyway they fell and I retreated my bomber starships out of there just in time to avoid the avenger. I'd also snuck some science lab MkII's into the corner of the map so I could harvest the science once it fell. that when the avenger dies it detonates a nuke. Destroying basically all my non-mkV ships and starships, which I'd all piled onto that planet to assist with killing the avenger. I thought about reloading a save and cheesing it a little since my fortresses could have comfortably finished the jobs while my fleet moved to the adjacent planet. But decided against it since I thought dealing with the death of my fleet would be a good challenge. If the computer had thrown all of it's threat against me simultaneously I probably would have been dead. As it happened it only threw most of it's threat against me, and did so piecemeal, such that I was able to scramble a long and close defense. This was really fun and tense especially since I'd been on a bit of cruise control for most of the game. At one point I was very close to losing my advanced starship constructor, I had to manually position a riot control starship with shields over it to take some hits, and even then they got it down to about 15% health before I wiped out their ships on that system. In total I think I lost two command centers, but since I wasn't using some of my fortresseses anymore it didn't send me into a brownout. Once I'd stabilized, I decided to spend my remaining knowledge on Heavy Beam Cannons MkI, Grav Turrets MkI, and Economic Command Stations MkII. For the last part I was deciding between either that or metal harvesters mkIII, my experience earlier with the brownout convinced me I wanted energy as well as metal (oh yeah I'd started running out of metal in the course of replacing the massive losses incurred) which tipped the scales in favor of the Econ stations. The other stuff was for defense against starships and guardians (and carriers). I quite enjoyed this game and it feels good to win. I think I may have played on too low a difficulty setting for my skill level and knowledge of the game, but seeing as I'd never won before that was ok. I think I over-prepared for CPAs and regular waves and underestimated the reprisal waves and threat fleet. I also had a little difficulty groking the economy and considerations therein. For the bulk of the mid game, I had maxed out resources and more energy than I knew how to spend. And then suddenly I had no resources and was experiencing brownouts as soon as I took some moderate (ok moderate/large) losses. Maybe that’s actually more interesting in terms of making the situation feel dangerous, or maybe I just need to pay more attention to economic stuff. In terms of ships, assault transports filled with high mark bombers and bomber starships was my bread and butter. Even against guardposts that were strong against polycrystal, like laser, they'd just kill the guardpost so fast it wouldn't get to do much damage to them. Flagships might have been good, because I just mixed them in with the rest of my fleet and upgraded them around the same time as I upgraded my triangle ships it's hard to tell how much they specifically contributed. Riot Control Starships seem like they'd be good if you're willing to micro-manage their tactics. The thing is, I usually have other things I'd rather micro-manage and so they just ended up pulling enemy ships around in the fleetball which looks cool but I don't think does much. I guess that one with the shield saved my ASC, which is something. Bulletproof fighters I fully upgraded because the AI homeworlds had I believe 5 leech guardposts between them, and since bp fighters are immune to that ammo and match up well against that hull type they could take those down while freeing up my bombers to focus on other targets. Also sometimes I'd have a wave come through and the ships would die (or retreat) and I'd be left with a single AI leech starship flying around the system shooting my harvesters. Taking it down with the small contigents of ships I left for defense was generally hard because the leech ship would convert some against the others, but with bp fighters even MkI's could take it down. Anti-armour I fully upgraded in part because I still was finding myself having killed all the AI fleetships but having a bunch of starships and guardians remaining, I think they helped kill those although again they were always mixed in with other ships so it's hard to tell how much impact they specifically had. For defenses force fields, both hardened and regular, were my biggest knowledge sinks. Doing the 'Kahuna'-style defense eats up quite a bit of force fields since they cover both the command center and the tractor beams. And then it seemed like at the end they weren't buying my command centers all that much time anyway. Then again having no force fields seems like it would be suicidal. Anyway, I also got HBC I, Grav I, Tractor II, Laser II, Missile II, Fortresses and Mini-Fortresses. The last two definitely eat up energy, but I had some to spare so it was cool. Laser and Missile I got around the same time as I invested in the fortresses to try and cover Fort's weakness to polycrystal. Even though I said earlier that I didn't think it was super challenging for me at 7/7, I did like that when it did get hard towards the end it happened 'organicallly' rather than being one big thing (mostly, the spoilered avenger part less so). 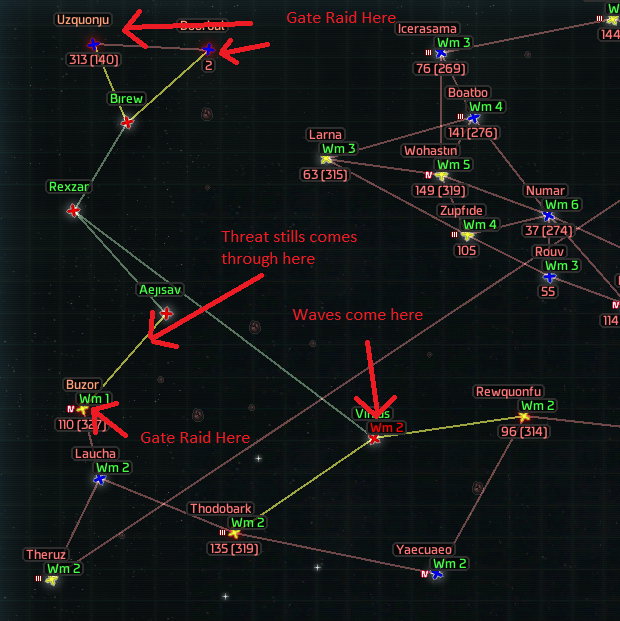 Specifically, the sequence with the reprisal wave causing a brownout which nearly screwed me during the exogalactic attack was a cool example of a bunch of little things building up and nearly losing me the game. Anyway, I’m going to increase the difficulty for my next game. I’m also going to start adding in some of the expansion content. Probably I’ll select more aggressive AI personalities so that there's a little more pressure defensively. I think having two defense-focused AI personalities is part of why the reprisal waves seemed much more dangerous then the regular attacks. I also think it made conquering the planets a little bit of a slog in places. Mine Enthusiast's unique gimmick seems like it was bypassed entirely by using Assault Transports to go everywhere, which I do anyway. Fortress Baron was sometimes interesting when the fortress was overlapping with some kind of obstacle that my bombers matched up poorly against. I'm not sure if people still read this forum much. But I'd like to thank the people at Arcen Games for making this, and to the people who have posted useful stuff in the strategy forums for contributing to that. Specifically Kahuna for their guide which was very helpful in terms of how I set-up and thought about defense. Congrats on your first win! It's a wonderful feeling, isn't it? Sounds like you have a good handle on the game, so moving up in difficulty a bit should keep the challenge there. Moving to 8/8 is probably a good next bet. 9/9 ups the challenge a lot, with much weaker AIP reducers and significantly higher wave/reinforcement multipliers. You mentioned doing some knowledge hacks, but have you considered doing some hacks for grabbing your Advanced Starship Constructor or for unlocking Fabs without capturing? That can help keep your AIP lower while still enhancing your fleet. Personally, I don't like to end the game with a positive hacking balance; I'll often use up the last bit on the AI Homeworld or Core Worlds doing sabotage or cloaking hacks. Have fun with your future games! Welcome to the game and to the forums, and congratulations on your first win! 7/7 is pretty tame once you learn how the game's systems work, but it's a decent way to learn those systems. You can also learn on 10/10 with everything on, but that only fits certain player personalities. Maybe yeah, although in this instance the planets more or less matched up with planets that were convenient for me to take as they were adjacent to ARS's or good stepping stones for going deeper. I think the big reason I had a positive hacking balance at the very end was the AIP increases from doing the AI Homeworlds. I forgot to mention this but I did two more planets of knowledge hacks during the midgame for a total of 4 planets k-hacked and one research redirection. I'll definitely consider that though in my current game where I might really want to do the hack for the ASC, not least so I don't have to worry about defending it. A great read, thanks for sharing and congrats on the first Win. Your comment at the end got me curious, it sounds like you just played with the base game settings is that correct, or am I missing some of the stuff you turned on. I have a long weekend coming up... maybe I'll burn it playing a new game of AI Wars instead of some other 4x.